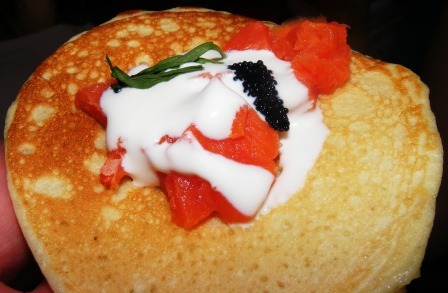 I recently made blini with smoked salmon and crème fraîche from Dorie Greenspan’s Around My French Table. And, as always when I make a recipe calling for crème fraîche, I looked at the price of it in the store and decided to make my own. Dorie has a recipe for crème fraîche in her book, and there are lots of recipes available online. My method differs slightly from other recipes I’ve seen and is based on my experience making it numerous times. 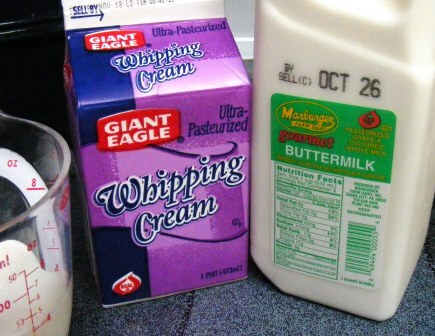 I start with 1 cup whipping cream and 2 tablespoons buttermilk. 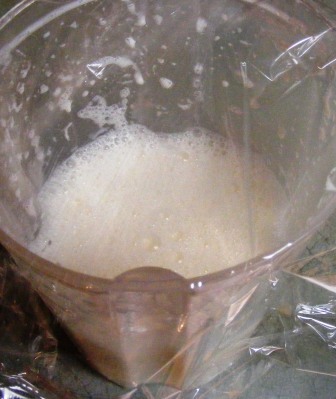 Most recipes recommend using pasteurized, rather than ultra-pasteurized, whipping cream. But because ultra-pasteurized is the only kind I can regularly find, that’s what I use. 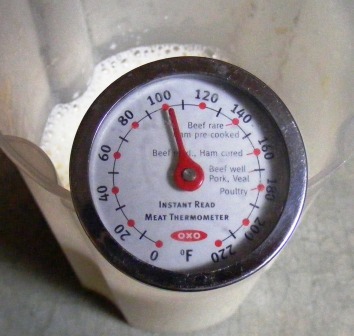 I heat the cream and buttermilk to about 100˚ to 110˚F. I find that heating the ingredients gives the culturing process a jump start. Next, I cover the container with plastic wrap and leave it on the counter for 36 to 48 hours, stirring once or twice per day. I let the cream culture until it thickens and gets tangy. It won’t be quite as thick as sour cream, but it will continue to thicken in the refrigerator. I put a tight-fitting lid on the container and store it in the fridge. It will keep for about 2 weeks and will continue to get tangier during that time. 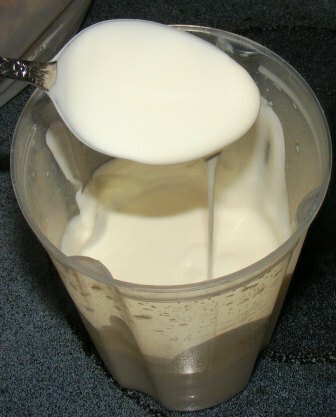 Heat cream and buttermilk in a small saucepan to about 110˚F. Put cream mixture in clean container, cover loosely with plastic wrap, and allow to culture at room temperature for 36 to 48 hours, stirring several times per day, until thickened and tangy. Cover container tightly and store in refrigerator. Yields 1 cup. Best used within 2 weeks. I have never tried making my own before, thanks for the recipe and the encouragement because you can bet I will now…those two ingredients are always in my frig and what’s not to love about a science experiment on the counter for a couple of days. Thanks! It’s as delicious as it is easy. I bet if you make it once, you’ll find yourself returning to it again and again! I haven’t made Creme Fraiche in a long time but you have inspired me. Looks wonderful! The season is behind us, but I love it just on fresh berries too! I agree about pre-heating, it does really help get it going. 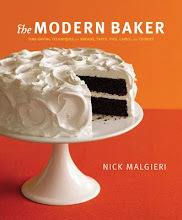 Most of the recipes I’ve read say 12-24 hours, but mine always seems to take at least twice that long. The preheating seems to help a bit.